Who will win Afcon 2015? The 2015 edition of the Africa Cup of Nations, which will be hosted by Morocco (hashtag #RoadToRabat), is circa a year away. Here, we ask some of the finest African football brains which team will triumph. We will come back to this in a year's time and then you’ll know which African Football Expert's clairvoyance to trust. Adam Mostefa: At the moment, I believe Ghana are favorites to win the 2015 AFCON. Having just recently re-witnessed what the Black Stars are capable of against my beloved Pharaohs – with the Ayews and KPG back in the picture, I believe it’s clear they currently have the most complete squad in Africa. On top of that, majority of this team have yet to reach their full potential. Atsu, Waris, Badu, among others look destined for big things, & I wouldn’t be surprised to see Assifuah become a crucial part of the squad by 2015 either. Interesting to note that the only 2 times Ghana won it outside of their country was in North Africa (Tunisia & Libya). Lookout, Morocco! Ed Dove: When looking ahead to the next Cup of Nations, a year from now, it’s hard to look too far beyond Nigeria. The Super Eagles have a firm nucleus of exceptionally talented players, a broad talent pool to explore and, for the first time in a long time, a stable set-up. In Stephen Keshi they boast a coach that is broadly respected and admired. The current generation possess both the potential and the promise of youth, but many of them have the swagger of champions, having taken part in the successful AFCON campaign of 2013.Certainly, there are some areas of the first XI that require polish, but there’s little that a successful World Cup campaign couldn’t refine. Alex Queiros: I’m going to bet on Nigeria to win it again. They won last year with a young squad and that generation will still have plenty to give come 2015. And, judging by their performances in the CHAN, they have home-grown talent good enough to beat some established nations, and I’m expecting to see some of those players making the trip to Morocco. I also think Morocco will perform well, due to the home factor, but the remaining northern African sides don’t seem to have it in them to win. Ghana and the Ivory Coast are also strong contenders but putting your chips on the Ivorians doesn’t seem to work very well. Abdul Musa: From Vincent Enyeama between the sticks, all the way through to Emenike and Moses leading the attacks, I think Nigeria definitely have one of the best squads in Africa. With Keshi leading the orchestra, Nigeria have come leaps and bounds in the last 12-18 months, managing to triumph in South Africa 2013 which was the Super Eagles first AFCON in 19 years since winning the trophy in Tunisia 1994. That surely bought much joy to the Nigerians, but I say to them, the best is yet to come. With the brilliant array of talent coming through and the strength of depth at Keshis disposal, I think Nigeria have the potential to dominate the continent for many years to come. Having the best goalkeeper in Africa, Godfrey Oboabona and Kenneth Omeruo as a potential centre back pairing in Morocco, as well as the intelligent control of midfield, Mikel provides and the abilities of Emenike and Moses in attack, the sky is the limit for this Nigerian side as they have proved all throughout 2013. To coach Stephen Okechukwu Keshi and his boys I say, Thank you for returning Nigeria to the pinnacle of African football. By the way, Nigeria will only win it by beating Sudan in the final on a dubious penalty decision awarded by Daniel Bennett after an Ahmed Musa dive under a perfect challenge by Saif Masawi in the 93rd Minute. Sam Crocker: Burkina Faso – Were the nearly men for AFCON 2013 and the World Cup qualifiers, and now I feel is their time. Assuming they keep the same team stability they have had for the past year or so, they can benefit from not going to the World Cup and the distractions it causes, allowing them to focus on the tournament in Morocco. As well as this, with new blood like Bertrand Traore and Steeve Yago in the team creates a fine blend of experience and youth. Of course, it will rely on Alain Traore and Jonathan Pitroipa being fit I feel, as well as the effervescent Aristide Bance. James Bennett: Ghana – The Black Stars are a young team blessed with some talented individuals, even when Michael Essien and Kevin Prince-Boateng choose to retire for a few months. They can only get better from here, which is scary considering how good they are at the moment. Their performance against Egypt in the World Cup play-offs provides a glimpse of what they are capable of. They just need to harness their potential for a full tournament. 2015 is as good a bet for it to happen as any, as I have no doubt that they will qualify. Salim Masoud Said: It’s hard to look past Nigeria, Ivory Coast and Ghana – I’d be very surprised if one of them doesn’t win it. It’d be sweet if Ivory Coast won it in what will probably be the swansong for the core of golden generation, but I think Nigeria will retain the crown. They don’t have the largest amount of stardust out of the three sides, but they have the best equilibrium. Stephen Keshi is building a side which may not always fire on all cylinders but it is hard to beat and, as a result, very much suited to tournament football. Maher Mezahi: Algeria – Thousands will spill across the superficially locked border into Morocco as Les Fennecs should enjoy boisterous support in January. This young team possess an immaculate blend of youth and experience, and will also benefit from an administrative stability that is quite rare in Africa. Those advantages, coupled with accrued experience of consecutive World Cup appearances makes Algeria my unbiased pick for winners of the 2015 African Cup of Nations. Oluwada Lotfi: I can’t appoint only a favourite for AFCON which is in my opinion one of the most open tournaments. So I have decided to take 3 teams who will surely be top of the charts during AFCON 2015! 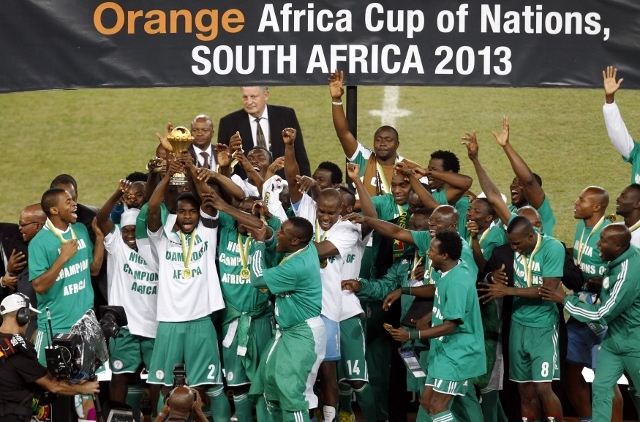 Nigeria can ride the wave of AFCON 2013 success on one condition: continuity. The issue of continuity has been essential for African football in the previous years. The most intriguing will be post-WC period. In terms of management, it’ll be a key period for Super Eagles. Two issues will surely appear: 1)The Nigerian Football Federation will kick Keshi after a poor WC performance ( I don’t wish this happens, to be honest) or 2) The NFF will retain its confidence in Keshi independently of the WC result and give the BIG Boss the objective of retaining Nigeria’s continental crown. The Black Stars have in the past reached fantastic World Cup results (round of 16 in Germany 06′ Round of 8 in South Africa 10′) but the team is always falling at African level. Time runs and Ghanaian people and players continue craving winning AFCON. The team which is probably the best roster of Mama Africa in terms of quality and depth must win, in my opinion, an AFCON to complete their page of Ghanaian football history in which the African paragraph is missing! Ivory Coast: the very last Elephant’s trumpeting ? Others teams like Egypt (with a talented squad but depends strongly on the country’s situation) Morocco ( home advantage + quality players but should improve collective spirit) Tunisia ( strong base but terrifying lack of creativity) could be dangerous to play as usual. 2 Comments on Who will win Afcon 2015? A North-African team will win it, and i will go for Egypt. Egypt’s new generation and new team is being made by Hassan Shehata’s Ex-assistant and youth WC Bronze medal holder : Shawky El Ghareeb.